Easter is almost upon us and one of the fun events during this special celebration is decorating eggs. I am a serious Spellbinders addict and will add a die cut image to just about anything. It was not a far stretch of my imagination for me to add Spellbinders Banner Basics Two, Banner Basics Three and Play Time die templates to my hot pink colored eggs. 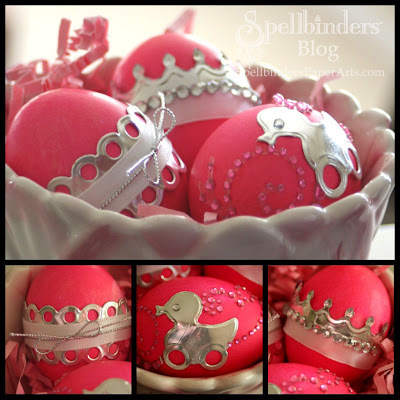 Spellbinders Premium Craft Foil is easy to cut and shape around irregular shaped objects which added to the sparkle and shine on my eggs. For further details on this project visit the Spellbinders Blog. How cute are these?!!! LOVE them! Wow! These are awesome! I love the one with the "crown" just gorgeous:) TFS!! Oooooooh this are so cute!! Kazan, you just come up with such creative ideas. I love this one. Will have to try these. Love the use of foil. 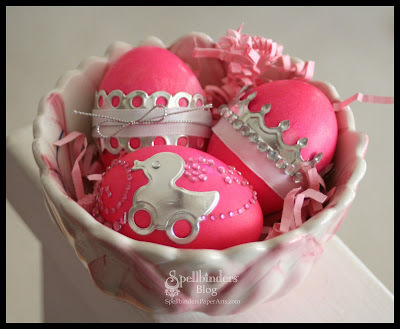 What a fabulous idea to add a special touch to the eggs! WOW! Thanks for the inspiration.